Saturday was a chilly day here, with some rain showers. I was outside for part of the day and was glad to get back home, where I could warm up! When I looked out the window by the front door, I noticed a rabbit on the steps, looking perfectly comfortable. 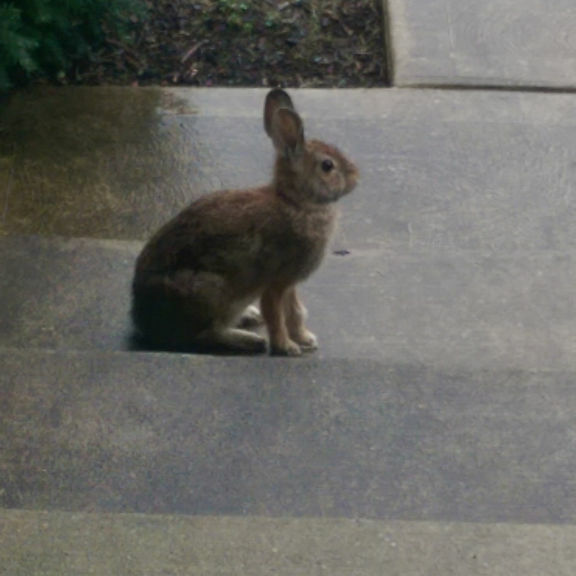 My first thought was that the rabbit wanted to get out of the wet, too! I didn’t invite the rabbit in for tea, like in old-fashioned storybooks, but I did take a photo as a self-nurturing reminder. While it’s good to get outdoors and be active, having a warm and cozy house to come back to later is always something to appreciate! The blessings of having a warm place to go and nurture ourselves. A place to feel gratitude everyday. A perfect reflective post. Thanks for the lovely comment, Isadora! What a blessing to have a nice and cozy home after hours of hard work outside. That pic is very cute. Thanks Indira, glad you enjoyed it!